Have Fun and Protect the Planet With Some Upcycled Garden Magic! 27th and 28th April 2013 11am – 5pm Tucked away in the idyllic West Sussex village of Fittleworth is the magical one acre wonderland of Pooh House and Gardens. 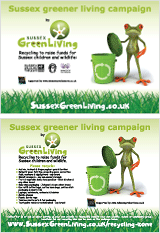 Here is a simple and free recycling activity for the children during the summer holidays. Make your own unique envelopes…. Upcycling – Knitting Plastic Bags!